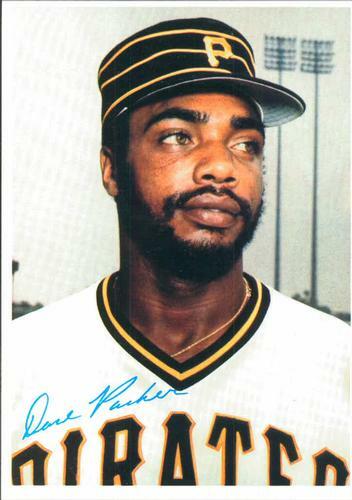 How you remember Dave Parker depends largely on what you remember him for. Do you remember him as one of the best players in the major leagues in the last half of the 1970s? The man who was the National League’s Most Valuable Player in 1978 and MVP of the All-Star Game in 1979? The man who played a key role on the Pittsburgh Pirates’ 1979 World Series champions? Or do you remember him as the overweight, injury-prone drug user who was the target of anger and resentment from Pittsburgh fans in the early 1980s when his production dropped off after he signed what was at the time the most lucrative contract in baseball history? The man who testified at a high-profile 1985 trial in federal court about his cocaine use and as a result was sued by the Pirates for fraud? Parker’s final totals after 19 seasons in the big leagues are impressive: 339 home runs, 1,493 RBIs, 2,712 hits, and a .290 batting average. He finished in the top five in the MVP voting five times (and got votes in four other seasons), played in six All-Star Games and was on the roster for another (and wasn’t selected for the game in his MVP year due to injury) and was a regular in the lineup for two World Series winners. It’s a resume similar to that of Jim Rice, Parker’s American League counterpart for MVP honors in 1978. But while Rice was elected to the Hall of Fame, Parker never received as much as 25 percent of the vote in his 15 years on the ballot (Rice never received less than 29 percent), perhaps because the memories of the cocaine years and the perception of squandered talent were too much for some voters to overcome. After being sent to Monroe (North Carolina) of the Class-A Western Carolinas League, Parker re-established himself as a top prospect, batting .358.19 Then in 1972 he earned player-of-the-year honors at Salem (Virginia) in the Class A-Carolina League, leading the league in batting average, RBIs, runs scored, hits, doubles, stolen bases, outfield putouts, and outfield assists while missing the home run title by one. Parker hit .354 in September to finish the season with a .288 mark. But the left-handed hitter was used strictly as a platoon player; all of his 31 starts came against right-handed pitchers and he had just 10 plate appearances against lefties. In 1974 Parker was on the disabled list most of June and July with a hamstring injury. He finished the year with a .282 batting average but just four home runs in 220 at-bats, and again he saw limited action against lefties (three starts and 27 plate appearances). Parker struggled at the plate when he came back from the injury, at one point going into an 0-for-24 slump. But he rallied to play the best baseball of his career down the stretch, batting .381 in August and .412 after September 1 to win National League Player of the Month honors in consecutive months. He finished the season with a major-league-best .334 batting average plus 30 home runs and 117 RBIs while leading the league in total bases, despite missing 13 games due to the injury. He won Most Valuable Player honors, receiving 21 of the 24 first-place votes. On January 26, 1979, the Pirates announced they had signed Parker to a five-year contract that would begin in 1979 (replacing his existing agreement). While the terms aside from the length were not disclosed, it was immediately, and for years afterward, referred to as baseball’s first million-dollar-a-year contract.34 But while the contract was designed to pay Parker at least $7.75 million, the money would be paid out over 30 years, and he would not receive $1 million in any year he played. Parker was named the most valuable player in the 1979 All-Star Game at Seattle’s Kingdome, not for his bat but for his arm. In the seventh inning, with the AL leading 6-5, Parker overran leadoff hitter Jim Rice’s shallow fly ball, went back into the right-field corner to retrieve it after a high bounce, and retired Rice trying to advance to third base with a one-hop throw. Then in the eighth, with the game tied 6-6, Parker fielded Graig Nettles’ hit in deep right field and threw home. The ball reached catcher Gary Carter shoulder-high on the fly, and Carter tagged out Brian Downing trying to score the go-ahead run.38 The National League scored in the ninth and held on to win 7-6. With Parker and 39-year-old first baseman Willie Stargell, the National League’s co-Most Valuable Player, leading the way, the 1979 Pirates won 98 games and the National League East championship, after which they defeated the Cincinnati Reds in the National League Championship Series and the Baltimore Orioles in the World Series. Parker hit .365 in September and .341 in 10 postseason games, even though he was troubled by his left knee that was injured swinging at a pitch in late August, making it painful for him to try to pull the ball.39 His 10th-inning single drove in the winning run in Game Two of the NLCS, and he was also credited with the game-winning RBI in Game Three of the NLCS and Game Six of the World Series. Things between Parker and Pittsburgh fans were so bad that he skipped the victory parade after the 1979 World Series. “Why should I? Where were they when I needed them?” Parker said.41 And things would get much worse over the final four years of his contract. Parker had cartilage removed from his left knee after the season and recovered in time to start the 1981 campaign. But in a season that was interrupted by a nearly two-month players strike, he played just 67 games. He spent two weeks on the disabled list in May with a slight tear in his right Achilles tendon,49 then missed time in late August and September with a painful thumb injury.50 His batting average dropped to .258 and he hit only nine home runs, and his once-feared arm produced just one assist. Somehow 1982 turned out even worse for Parker than 1981. He was out nearly six weeks in May and June with torn cartilage in his right wrist and spent another six weeks on the disabled list from late July until early September after he ruptured a ligament in his left thumb in a head-first slide.54 He wound up playing only 73 games, with just six home runs. Parker stayed off the disabled list in 1983 (although he later said he had a problem with his Achilles tendon all season55) and played 144 games. He went into the All-Star break with a .242 batting average and only three home runs, but the 32-year-old suddenly showed flashes of his old self in the second half, dropping his weight to 225 and hitting .305 with nine homers and 48 RBIs. Pirates fans forgave him enough to give him several standing ovations.56 The comeback came at an opportune time, with Parker entering free agency for the first time after the season. In 1984 Parker drove in 94 runs, his most since the Pirates’ 1979 championship season, and hit .285. The Reds rewarded him with a three-year contract extension, and Parker rewarded them with one of his best seasons in 1985. He hit .312, his 34 home runs and 125 RBIs were career highs, he led the league in RBIs, total bases, and doubles, and he ranked second in hits and homers. He finished second in the Most Valuable Player voting to Willie McGee, who hit a league-leading .353 for the National League champion Cardinals. But Parker’s on-field performance in 1985 was overshadowed by his testimony in a federal court drug trial in Pittsburgh in September. Granted immunity in exchange for his testimony against a man charged with distributing cocaine to professional baseball players, Parker said he first used cocaine while playing winter baseball in Venezuela in 1976 and had used the drug “with consistency” from 1979 until he quit late in the 1982 season because “my game was slipping. I felt it played a part in it.”60 He also named several other major-league players who he said had used the drug. Parker had another fine year for the Reds in 1986, playing every game and finishing fifth in the MVP voting. He led the league in total bases while hitting 31 homers and driving in 116 runs. In 1987 he drove in 97 runs, but his batting average dropped to a career low .253 (just.228 after the All-Star break), and after the season the Reds traded the 36-year-old to the Oakland Athletics for young pitchers Jose Rijo and Tim Birtsas. Parker was in the A’s 1988 lineup almost every day, either in left field or as the designated hitter, until he strained ligaments in his right thumb sliding into second base on July 3.66 He returned to action in late August and was the regular DH after that, helping the A’s win the American League pennant. He finished the year with modest numbers: a .257 batting average, 12 homers, and 55 RBIs in 101 games. The World Series marked the end of Parker’s tenure in Oakland. He was a free agent after the season, and with the A’s deciding not to offer a multi-year contract, he signed a two-year contract with Milwaukee.68 He repeated as Designated Hitter of the Year with the Brewers, hitting .289 in 1990 with 21 homers and 92 RBIs. But the Brewers decided to get younger after the season, trading the 39-year-old Parker to the California Angels for 27-year-old outfielder Dante Bichette. Parker struggled with the Angels in 1991, hitting just .232 with 11 homers in 119 games, and was released on September 7. A week later he was picked up by Toronto and hit .333 in 13 games to help the Blue Jays win the American League East, but because he joined the team after September 1 he was ineligible to play in the postseason. Parker got back into a major-league uniform in 1997, when Angels manager Terry Collins (who had been the second baseman on Parker’s Carolina League team in 1972) hired him as first-base coach. “I really came back out just to be visible,” said Parker, who was on the Hall of Fame ballot for the first time in 1997, “and I actually fell in love with coaching.”71 In 1998, given the chance to work for Tony La Russa, his manager in Oakland, and become a hitting coach, Parker joined the St. Louis Cardinals coaching staff. But after that season Parker went home to Cincinnati, and as of 2015 had not had a full-time job in baseball since. In the most recent edition of his Historical Baseball Abstract, published in 2003, Bill James ranked Parker the 14th best right fielder in baseball history.74 Of the 13 players ranked ahead of him, only Pete Rose, who is ineligible, is not in the Hall of Fame, and several players ranked behind him are in as well. Will a future Hall of Fame Veterans’ Committee set aside Parker’s cocaine use, look at his numbers and vote him in? Regardless of whether Parker is ever selected for the Hall, he clearly qualifies on one count: Few players in the 1970s or ’80s were as famous (even if he was at times infamous) as Dave Parker. Special thanks to Michael Haupert, professor of economics at the University of Wisconsin-La Crosse, for providing a copy of Parker’s official contract card, and to Bill Van Niekerken, library director for the San Francisco Chronicle, for providing articles from the Chronicle’s archive that are not available online. David L. Snyder’s article in the January 2012 Albany (New York) Government Law Review, “The Cobra’s Contract: Revisiting Dave Parker’s 1979 Contract With the Pittsburgh Pirates,” is a comprehensive and fascinating look at the negotiations leading to Parker’s historic contract with the Pirates and the team’s lawsuit to dispute his deferred payments. The article is online at http://albanygovernmentlawreview.org/Articles/Vol05_1/5.1.188-Snyder.pdf. Two good sources for information about the Pittsburgh cocaine trial of 1985 are Aaron Skirboll’s book The Pittsburgh Cocaine Seven: How a Ragtag Group of Fans Took the Fall for Major League Baseball (Chicago: Chicago Review Press, 2010) and Steve Beitler’s article “This Is Your Sport on Cocaine: The Pittsburgh Trials of 1985,” published in the Society for American Baseball Research’s The National Pastime #26 in 2006. 1 Roy Blount, “A Loudmouth and His Loud Bat,” Sports Illustrated, April 9, 1979. 2 Birth weight from Bernie Lincicome, “New Uniform Suits Parker Just Fine,” Chicago Tribune, March 16, 1984: section 4, 1. 4 Bob Hertzel, “From Crosley to the Majors,” Cincinnati Enquirer, March 15, 1973: 49. 5 Courter Tech shut down in 1974. Its former campus is now the home of Cincinnati State Technical and Community College, more commonly known as Cincinnati State. http://cincinnatistate.edu/about-cs/cincinnati-state-histor. 6 Charley Feeney, “On Playground or Battlefield, Parker Is BIG,” The Sporting News, June 11, 1977: 3. 7 “Campbell Honored By PHSL,” Cincinnati Enquirer, November 20, 1968: 24. Parker’s exact statistics for the season are in question. In 1973, Bob Hertzel wrote in the Cincinnati Enquirer that Parker had 1,365 yards rushing in 10 games, a figure that was repeated in numerous other stories over the years. But when Parker was inducted to the Cincinnati Public Schools Hall of Fame in 2012, that organization said he “rushed for over 1,110 yards” and scored 68 points. That document is online at http://cps-k12.org/files/pdfs/Athl-HOF-12.pdf. 8 “Courter Is Minus Parker,” Cincinnati Enquirer, November 18, 1969: 44. Parker actually did return to the football team before the season was over and was named second team all-PHSL before undergoing the operation. 10 “CM World Series Rosters,” Farmington (New Mexico) Daily Times, August 15, 1969: 6. Other future major leaguers who played in the tournament included Rick Burleson, Steve Staggs, Mike Proly, Eric Raich, Tommy Bianco, Bob Kammeyer and Parker’s Wilson Freight teammate Barry Bonnell. Rick Kehoe, later a National Hockey League star, played for the team from Windsor, Ontario, and Mack Brown, who coached the University of Texas football team to the 2005 national championship, played for the team from Nashville. Wilson Freight lost both its games in the tournament. Parker was not a member of the Wilson Freight team that won the Connie Mack World Series in 1968. 11 It was a horrible draft for the Pirates. Of the 13 players they selected before Parker, only John Caneira reached the majors, and he played only eight games. And of the 46 players they took after Parker, only 23rd-round pick Ed Ott played in the majors. 13 Roy Blount, “A Loudmouth and His Loud Bat.” The Reds didn’t do any better job drafting than the Pirates did in 1970. Of the 13 players Cincinnati selected before Parker was taken, only Ray Knight, Will McEnaney, and Tom Carroll reached the majors. 14 The Sporting News, June 20, 1970: 6. 15 Charley Feeney, “Danny Juggles Bucs, a Tribute to Parker’s Bat,” The Sporting News, May 4, 1974: 12. 16 His most valuable player award is mentioned in the Pirates 1974 Press-TV-Radio Guide: 34. Parker’s high-school classmate Bill Flowers led the league in runs scored and stolen bases. 17 Bob Hertzel, “Reds Rained Out; Bucs’ Parker Wants to Make It Big Without Tag of ‘Another Clemente,’” Cincinnati Enquirer, May 1, 1974: 38. 19 Parker didn’t have enough plate appearances to qualify for the batting championship; the official league leader hit .343. 20 Charley Feeney, “Needless Slide May Put Clines on Shelf for ’73,” The Sporting News, July 28, 1973: 28. 22 “[Pirates broadcaster] Bob Prince made it famous, but Tony Bartirome gave me the nickname,” Parker said in 2012. http://blackandgoldworld.blogspot.com/2012/07/dave-parker-talks-coaching.... Prince’s Associated Press obituary and his biography included in the SABR BioProject both credit Prince with the nickname. 24 Ron Cook, “Dave Parker Deserves a Little Respect,” Beaver County (Pennsylvania) Times, April 6, 1980: C-4. 25 Phil Musick, “ ‘I’m Pursuing the Ultimate…,’” Sport, June 1979: 15. 26 Jerry Reuss, Bring In the Right-Hander! : My Twenty-Two Years in the Major Leagues (Lincoln, Nebraska: University of Nebraska Press, 2014). 27 Charley Feeney, “Fireworks Start in 9th as Mets Barely Nip Pirates,” Pittsburgh Post-Gazette, July 1, 1978: 11. 28 Parton Keese, “4-Run Rally in 9th Beats Pirates, 6-5,” New York Times, July 1, 1978. 29 Charley Feeney, “Parker Eyes Quick Return to Buc Lineup,” Pittsburgh Post-Gazette, July 3, 1978: 11. 30 Paul Lukas, “Aggh! It’s Dave Parker at the Plate!” http://sports.espn.go.com/espn/page2/story?page=lukas/080724. 31 Charley Feeney, “Parker’s a Bitter Cookie ... Not Enough Sugar,” The Sporting News, July 30, 1977: 9. 32 Charley Feeney, “Parker-Pirate Contract Duel Leaves Everybody Puzzled,” The Sporting News, November 11, 1978: 44. 33 Jack Lang, “Parker Wins MVP as He Hits – Convincingly,” The Sporting News, December 2, 1978: 59. 34 In a front-page story in the Pittsburgh Post-Gazette on January 27, Charley Feeney wrote that Parker “probably” received “a five-year package worth, including bonuses and fringe benefits, $5 million.” The headline in the New York Times story of January 27 referred to a “$5 million contract,” with Murray Chass calling it “a mammoth deal believed to be worth at least $5 million.” Roy Blount, in his April 1979 Sports Illustrated cover story, wrote that the contract was “worth more than $1 million a year,” and there are many such references after that. Parker even referred to himself as “the first million-dollar player” in a Sport magazine story in June 1979. 35 David L. Snyder, “The Cobra’s Contract: Revisiting Dave Parker’s 1979 Contract with the Pittsburgh Pirates,” Albany (New York) Government Law Review, January 2012, Vol. 5, Issue 1, online at http://albanygovernmentlawreview.org/Articles/Vol05_1/5.1.188-Snyder.pdf. Snyder says the contract called for payments continuing into 2008, even though 222 monthly payments beginning in January 1989 would seem to end in 2007. 36 Jim O’Brien, “The Cobra Strikes Back: ‘I’m the Best Player in Baseball,’” Sport, June 1981: 14. 37 Jim Murray, “Pirates’ Dave Parker Is Earning His Keep and, at $10,000 Per Base Hit, Then Some,” Ottawa (Ontario) Citizen, October 11, 1979: 25. 38 Dan Donovan, “All-Star MVP Parker Guns Down AL, 7-6,” Pittsburgh Press, July 18, 1979: C-10. The throws can be seen at http://youtube.com/watch?v=RkCE6JHUb00. 39 Charley Feeney, “Next Spring Parker ‘Can Talk Baseball,’” The Sporting News, November 24, 1979: 49. 40 Hal McCoy, “Parker: He’s Worth Every Penny to Reds,” The Sporting News, July 22, 1985: 21. 41 Phil Musick, “A Cobra Among the Cuties,” Pittsburgh Post-Gazette, August 8, 1980: 13. 42 John Clayton, “Parker Feeling Mighty Low After Assault With Battery,” Pittsburgh Press, July 21, 1980: B-5. 43 Dan Donovan, “Parker Still Shaken, Wants to Be Traded,” Pittsburgh Press, July 22, 1980: C-6. 44 Norm Clarke, “Parker Demands Trade,” Sumter (South Carolina) Daily Item, July 23, 1980: 1B. 45 Charley Feeney, “It’s Open Season on Bucs’ Parker,” The Sporting News, August 23, 1980: 17. 46 Associated Press, “Parker’s Wife Seeks Divorce,” Tuscaloosa (Alabama) News, August 4, 1980: 13. Dave and Stella met in 1973, and her divorce petition claimed they were married by common law in April 1974. “Stella ‘Parker’ Now Tells Her Story of ‘Divorce,’” Jet, September 25, 1980: 46. Parker was listed as married in the Pirates’ 1978 media guide but was shown as single in 1979 and 1980, when apparently the couple lived apart. “She’s an intelligent lady and I had considered marrying her,” Parker said after the divorce filing. “But she became too confining so we had to part.” Norman O. Unger, “Dave Parker Talks About Fears, the Heckling Fans, Lawsuit of ‘Wife’ and Woes of Fame,” Jet, September 18, 1980: 54. 47 Jane Gross, “For Parker, a Season of Insult and Injury,” New York Times, September 14, 1980. 49 “Dave Parker Becomes Latest Pirate Casualty,” The Sporting News, May 30, 1981: 30. 50 Charley Feeney, “A Talented Moreno Deserves Applause,” The Sporting News, September 26, 1981: 28. 51 Charley Feeney, “Parker Remains in Pirate Family,” The Sporting News, December 26, 1981: 43. 52 Bill Conlin, “Dawson, Schmidt Hot MVP Rivals,” The Sporting News, September 26, 1981: 25. 53 Charley Feeney, “Moreno to Ask Bucs for Five-Year Pact,” The Sporting News, November 7, 1981: 20. 54 Charley Feeney, “Bucs Get ‘Steal’ in McWilliams,” The Sporting News, August 16, 1982: 26; Charley Feeney, “Parker Has Surgery for Injured Thumb,” The Sporting News, August 9, 1982: 15. 55 Dave Nightingale, “The Resurrection of Dave Parker,” The Sporting News, March 24, 1986: 12. 56 Stan Isle, “Caught on the Fly,” The Sporting News, August 22, 1983: 13. 57 Associated Press, “Formality Rules in Re-entry Draft,” Nevada (Missouri) Daily Mail, November 8, 1983: 8. 58 United Press International, “Dave Parker gets married,” Ottawa (Ontario) Citizen, February 16, 1984: 43. 60 Jan Ackerman and Carl Remensky, “Parker: Used Cocaine for 3 Years,” Pittsburgh Post-Gazette, September 12, 1985: 1. 61 Michael Goodwin, “Baseball Orders Suspension of 11 Drug Users,” New York Times, March 1, 1986. 62 Greg Hoard, “Pirates Seek to Stop Parker’s Deferred Pay,” Cincinnati Enquirer, April 22, 1986: C-1. 63 Ira Berkow, “The Dispute Over Parker’s Contract,” New York Times, April 26, 1986. 64 Associated Press, “Pirates Say They’ve Settled Drug Suit Against Parker,” Los Angeles Times, December 13, 1988. 65 Bob Hertzel, “Pirates, Parker Reach Out-of-Court Settlement,” The Sporting News, January 2, 1989: 52. 66 Kit Stier, “A’s Loss of Parker a Bitter Pill,” The Sporting News, July 18, 1988: 26. 67 David Bush, “Parker Gives A’s Winning Look,” San Francisco Chronicle, March 15, 1989: D1. 68 Ray Ratto, “Parker Signs With Brewers,” San Francisco Chronicle, December 4, 1989: D1. 69 Jon Newberry, “Franchise Businesses Opening Doors of Opportunity,” Cincinnati Business Courier, December 31, 2007. http://bizjournals.com/cincinnati/stories/2007/12/31/story4.html. 70 Elliott Teaford, “Competitive Spirit: Fire Still Burns Inside Bowa, Parker, Who Will Bring That Intensity to the Angels,” Los Angeles Times, March 28, 1997. 71 Associated Press, “Coach Parker,” Southeast Missourian (Cape Girardeau, Missouri), March 14, 1998: 3B. 74 Bill James, The New Bill James Historical Baseball Abstract, (New York: Free Press, 2003), 976.